A reasonably frequent post in the Hills District Mums Facebook group is about recommendations for local places to go for high tea. And thanks to some great local businesses there is no need to trudge all the way to the city! You can enjoy a great high tea right here in the Hills. Here’s a list. One of our favourite local cafes Wolfe and Co has started serving high tea on a Saturday. 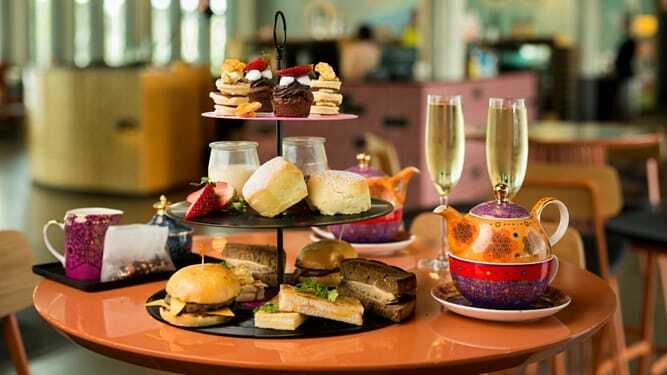 High tea is $25pp and $35pp with a glass of bubbles or a G&T. The menu changes weekly but has included chocolate French toast, ricotta tarts, creme brûlée, custard profiteroles, chocolate tarts, lamb sliders,Wolfe’s chicken sandwiches and truffle fries. Booking are essential. 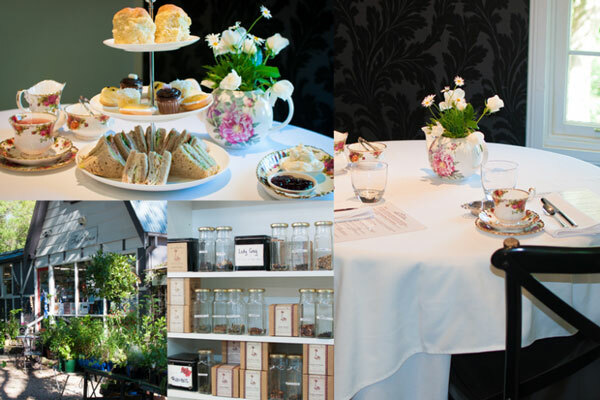 This is a little hidden gem and one of our favourites for high tea! When you walk in you feel like you have been transported to a quaint little country town or the Blue Mountains. This was maybe because of the sweet little gift shop attached – who doesn’t love a gift shop slash café?! But what was a surprise was the high tea itself. Pretty tea cups and pots, a lovely tea strainer and tiered plates of fresh tasty sandwiches and sweets. Our favourite was the divine little lemon tartlet. And the scones were a knock-out, with plenty of jam and cream to go with them. The tea list deserves a special mention for its creativity – teas include Congo Bongo, Snow White, Ruby Sipper and Eve’s Temptation. We think this is perfect for meeting a good friend for brunch or lunch or when you feel like taking a day trip minus the driving. Oh, and it’s a proper little nursery too which is extra sweet. Open Tues – Sun, 9am – 4pm. Bookings for high tea preferred. 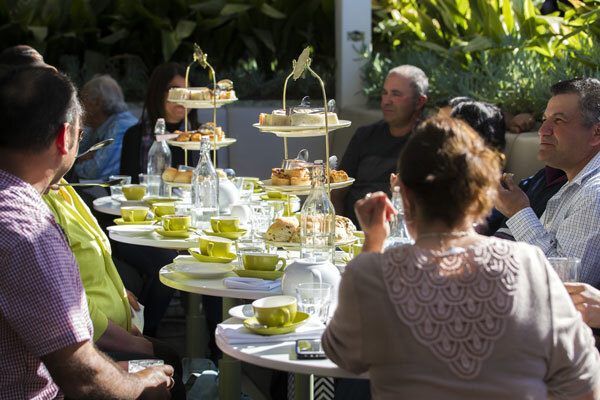 Group bookings for a high tea functions are also possible. High tea at the Bella Vista Hotel in a word is FUN! It’s bright, there are bubbles and you’re going to have a good time. There’s plenty of food to go around that’s for sure in the form of sandwiches, antipasto and cheeses, savoury tarts, scones, sweets and fresh fruit. But it’s probably safe to say that if you’ve come to high tea here the food isn’t your sole focus. It’s probably more about having a great afternoon with your girlfriends – somewhere you can linger and chat into the evening. 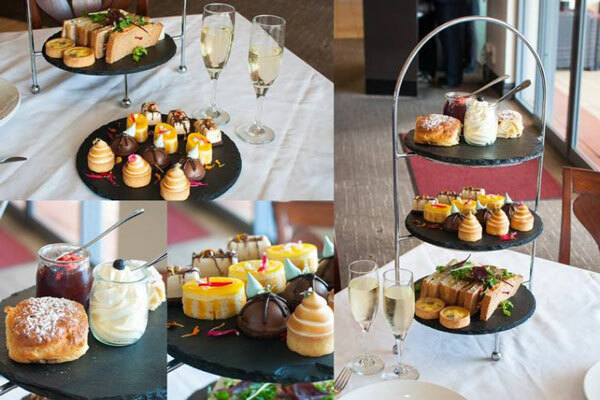 We think high tea at the Bella Vista Hotel is perfect for a hen’s, baby shower or special birthday party. You can take over a little section of the hotel that you then have totally to yourselves to kick up your heels. Available every Saturday and Sunday afternoon, 12-5pm. Minimum of 2 people and bookings are essential. $38 per person or $42 per person (with a glass of champagne). High tea is served for reservations only. It’s available Monday to Friday 12.30pm to 4pm and from 2pm to 4pm on Saturdays and Sundays. High tea at the Fiddler? Well, yes, don’t mind if we do! A while back high tea at the Fiddler would have been an oxymoron, but not these days! This is a good looking venue and a great high tea option for larger groups. 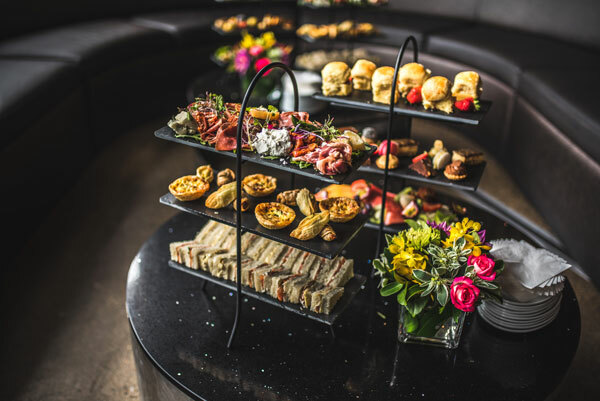 The Fiddler High Tea is $40 per person includes ribbon sandwiches, mini quiches, sausage rolls, truffle and mushroom arancini plus scones and a selection of mini desserts. You also get teapots of English breakfast tea. Bookings are required and there’s a minimum of ten guests – this makes it a good option for something like a hen’s do or a birthday celebration. High teas in hotels are really where the craze began. 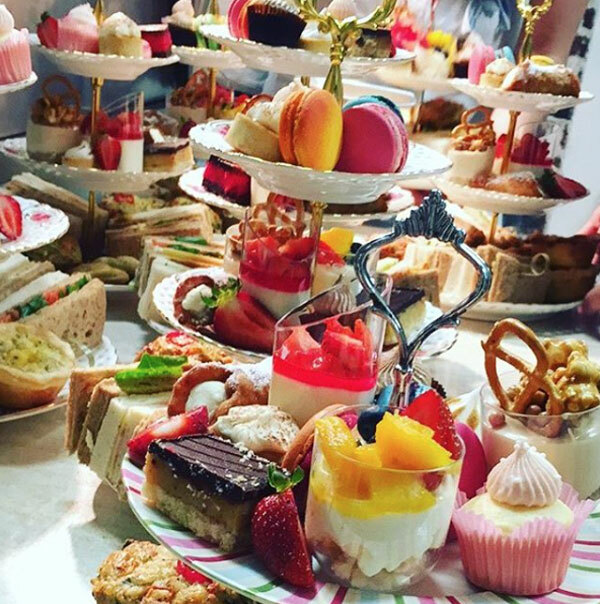 The Novotel Norwest High Tea is a three tier affair. Top tier are the raisin scones with strawberry jam and cream. Second tier are sweet goodies (currently they are a mojito meringue tart, espresso & white chocolate slice, pannacotta and a chocolate mousse cup) and the third tier is the savoury finger sandwiches and mini quiches. 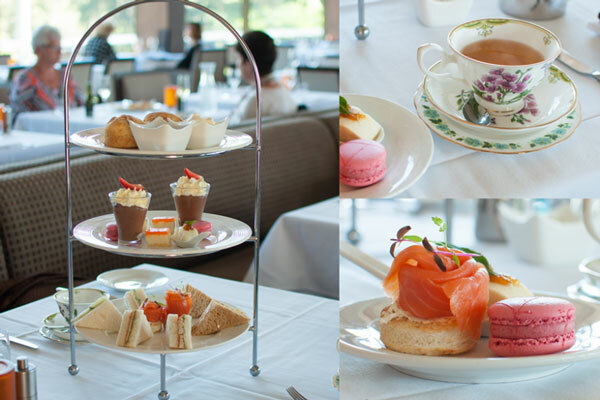 High tea is served on Saturday and Sunday from 2pm – 4pm and bookings are essential. If you’re looking for a high tea in a ‘vintage’ setting then The Vintage Pantry in Pitt Town is for you. Enjoy a three-tier stand, featuring a range of homemade sweet and savoury delicacies including delicious scones served with strawberry jam and whipped cream, and a variety of finger sandwiches with your favourite fillings. It’s $48 per person or $28 for kids aged 12 and under. Bookings are essential. The Gatehouse is located at the Macquarie Street entrance to Parramatta Park. Built in 1887, it forms part of the colonial history of Parramatta and in 2007 the cottage was granted World Heritage Listing by UNESCO. There’s the option to sit in the gardens or in one of the dining rooms inside – The Elizabeth Room and the Henrietta Room. There are various choices of high tea, ranging from the norm right through to a grand affair involving a piccolo of Moet and Chandon! There’s also a savoury high tea for those that don’t have much of a sweet tooth – think home-made zucchini, carrot and pumpkin muffins with cucumber yogurt. They also do a kids high tea if you’re visiting with children and cater for dietary requirements including gluten free and vegan. High tea starts from $39 per person ($49 on weekends). In Winter, you can enjoy your high tea near an open fireplace at The Hills Lodge! Enjoy a selection of miniature cakes and tarts, dark chocolate covered strawberries, scones served with strawberry jam and double cream, ribbon sandwiches and warm savoury pastries. 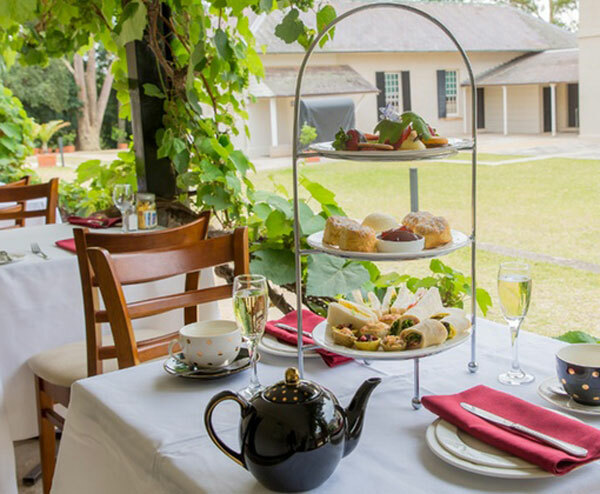 Their classic high tea is $49pp and includes a glass of sparkling wine. If you want to upgrade, it’s $69 per person with a glass of Moet! This is good option if you’d like to do High Tea with your little ones. They have a Teddy Bears Picnic High Tea which includes ham sandwiches, a strawberry and a strawberry macaron with either juice or babyccino for $9.95. 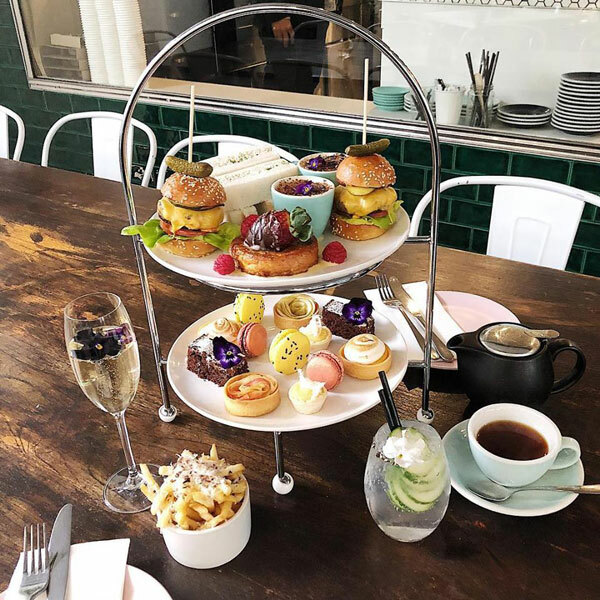 The adult’s high tea is $34.95 and includes ribbon finger sandwiches, a home baked English scone served with cream and jam, and an array of High Tea fancies. Served with your choice of tea or coffee. Castle Towers (located near Myer) | Book online here. 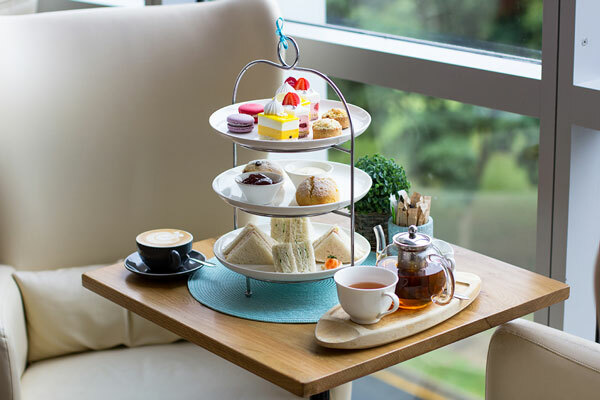 The Atura Hotel in Blacktown offers a roadhouse twist on the traditional high tea with their Hip High Tea. Enjoy your high tea poolside under the shade of the fringed umbrellas or in the industrial-styled lobby. Bookings are essential with a minimum of 24 hours notice. High tea is served on Saturdays 12pm – 2.30pm. $45 per person or include a glass of bubbles for $55 per person. 32 Cricketers Arms Rd, Prospect. 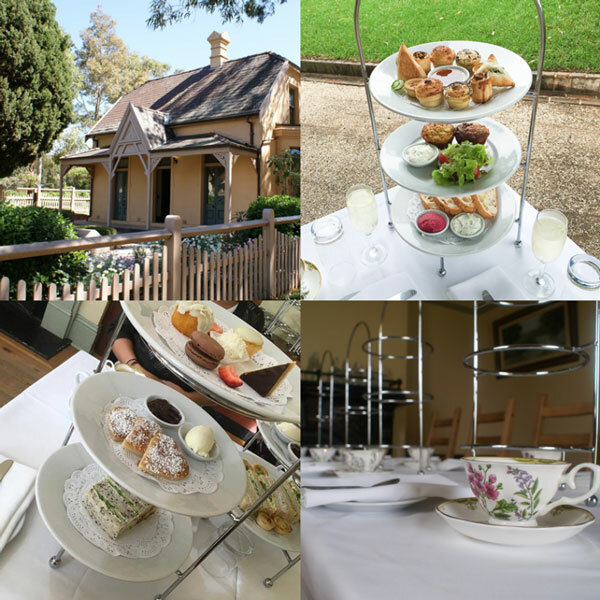 If you enjoy doing high tea in a historical building then this one is for you. The high tea at Lachlan’s includes scones, elegant petite sweets including lemon tarts, chocolate brownie, macarons and chocolate dipped strawberries ad savoury sandwiches, tarts and cocktail pies. High tea is $52 per person and includes a glass of champagne on arrival. If you liked this article you may also find out about….